Steve is new to sailing but he did get to use the boat this year - and reports "Awesome"
Her new name is Lady Grace. Click here to go to her. September 15, 2012. Mark Gaudette send in an email (below, minor edit) ) confirming his boat has been sold. We're standing by for the new owner to check in. My boat was sold back in June of 2012. I miss the boat. I upsized to a Southern Cross 31 but will looking for another Dolphin when the inevitable down sizing knocks on the door. Great work of the website. Thanks for all your work in keeping it up. May 20, 2012. We have a report that this boat may have been sold. We are trying to confirm it. February 4, 2012. Our last contact with Mark Guadette was October 26, 2011 when he advised that Stella Maris is still for sale. She has been winterized and shrink wrapped, and on the hard at Town River YC in Quincy, Massachusetts. In the meantime we found this super picture with a For Sale sign on her. September 24, 2011. The Craigslist ad for Stella Maris was updated. May 19, 2012. The link, http://boston.craigslist.org/sob/boa/2606014718.html, is not longer up but here was the ad. 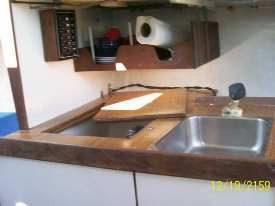 DOLPHIN 24 MORC CLASS SLOOP "
I do not know the Hull # as there is no builder's plate or any number on the boat. The sail had a Dolphin insignia on the sail with the number 902. Have no idea what the 902 would indicate. 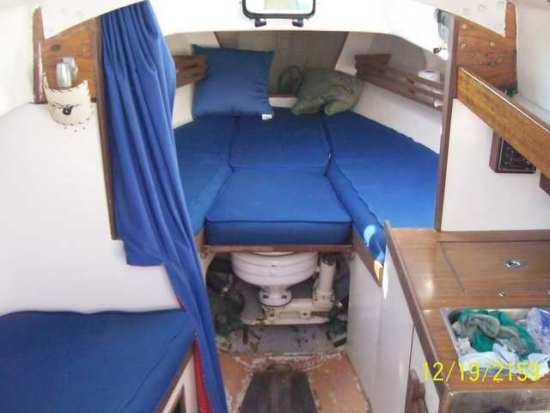 Judging from pictures from other boats it appears to be the Lunn Laminate version. 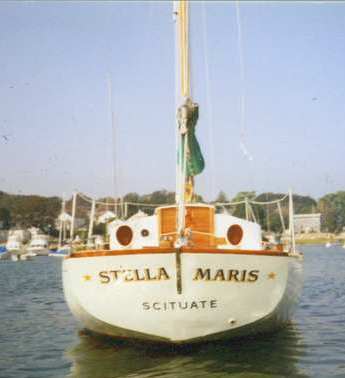 Previous owner prior to 2000: Jim Russel, Hull name "Stella Maris", Home Port, Scituate MA. 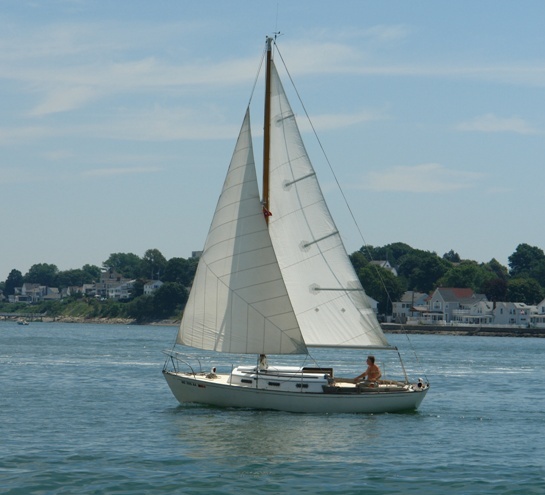 Current Owner: Mark Gaudette (that would be me) no name on hull, Home Port, Quincy Ma. 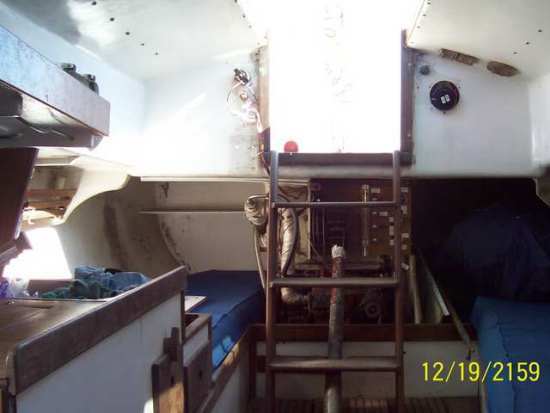 FYI, I recently purchased a Southern Cross 31 needs some work and thus the sale. 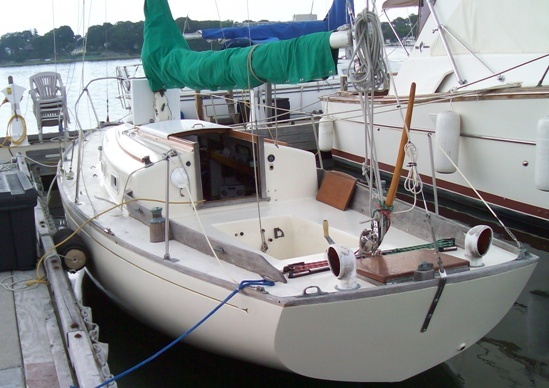 I’m reluctant to sell the boat as it's the best sailing boat I have owned. 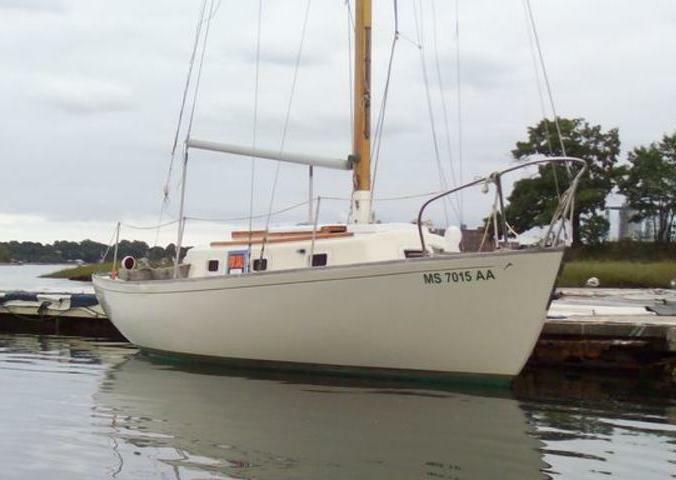 If it doesn’t sell I may just put it in storage for my daughter to sail in a few years or perhaps for my retirement years. This appears to be a newly "Found Dolphin" - if correct, the 161st. We hope to get additional information and confirm this. September 1, 2010. Mark sent in some pictures and more info regarding his Dolphin (minor edits). We are 'officially' making this boat a 'Found Dolphin" #161. 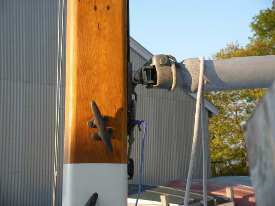 Ron, In regard to my Lunn Laminate dolphin hull just posted I have attached some larger pictures. Hope they are not too large or too many to go thru. I have a bunch. Pictures of the interior will be forthcoming as they are in my camera on the other boat. It definitely appears to be Lunn or Kit boat of same era. Flanged deck joint, bridge deck same height as deck, teak trim, partial fiber glassed encased deck beams, clamshell trim, etc. 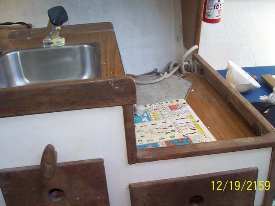 Wood mast, interior appears different - ice box, sink, and stove are on starboard side, head under V-berth, integral water tank under forward part of starboard qrtr berth, bronze centerboard. So maybe a kit boat ????? She was Jim Russel's Stella Maris. We'll try and find out more about this boat from him, if we can find him. I did find some more info after going thru old paper work. 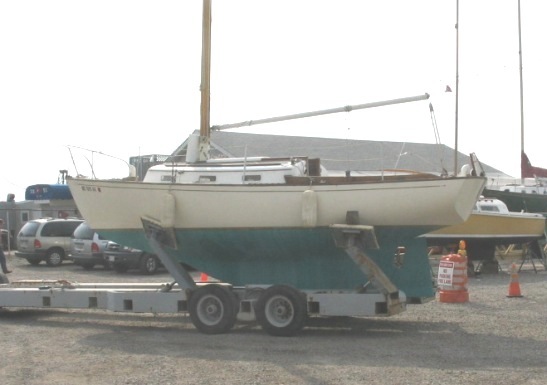 The immediate previous owner is Capt James Russel of Scituate, MA, Jim was getting along in years when I purchased the boat I hope he is still in good health. I found a copy of the a pre-purchase survey done in October of 1996 on behalf of Jim Russel The previous owner to Jim was a John Sciretta from Newtown, MA. Boat name was Second Wind. Boat was listed as a 1967 but I am in agreement that the boat is probably a 1961 Lunn. I have attached recent pictures of the interior, etc. This picture is particularly interesting. That winch handle is the gear lever for the Palmer 27 inboard. Here is Mark's description/explanation (excerpt edited) in response to a follow up question. August 15, 2015. Dolphin.org staff has been working on the history of Stella Maris and has developed an interesting, if complicated story. Her first owner was Justin Kerwin and her name was Leprechaun. The story developed when your webmaster was setting up his boat in Rockland, Maine and a woman above on the bulkhead above called down "Hey Ron - is that you"? That encounter led to meeting a guy named Dave who used to own a Dolphin 24 named Touchstone. Anyway, if you want the whole story start with the link to Touchstone. I read the articles (about Touchstone and Leprechaun). Very interesting. I can add the following. If ballast was added it might have been added externally outside in the keel area as I saw no sign of any internal ballast added but who knows ? I can tell you that it sailed fantastic though. 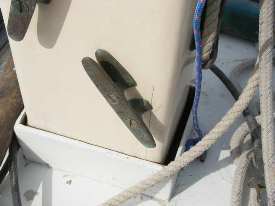 It did have the aluminium box beam located under the mast step as described. I got the boat with the aluminium roller furling boom. Stated some where in the article that it was swapped for a regular boom. Mast boxed hollow mast of very good construction. Interior was a fake wood grain Formica. 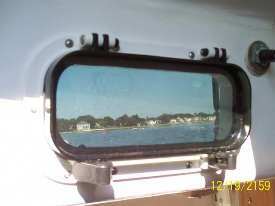 Had a fibreglass companionway hatch . It did come with a teak cockpit grate (it was beat up I never used it). Came with whisker pole and with spinnaker which I never used - looked like it had very little use. I sold it with the boat. It might be the same one shown in one of the earlier pictures. I replace the fixed aluminium ports with Beckson plastic opening ports. Centerboard was a bronze plate. I added the traveller set-up with the Harken blocks . Original traveller used a continuous main sheet arrangement using cleats. Rudder was hollow. I drilled a hole in bottom to drain out the water when on the hard. 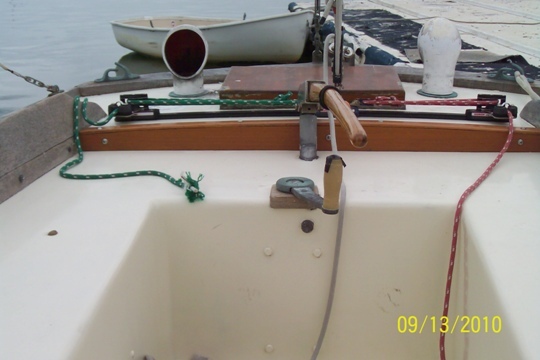 Bow rail was replaced (A sailboat boat toppled over in the yard and the mast defected off my forestay and bow rail . Very lucky that is all that was damaged. Hope this helps some. Sure sounds like the same boat. 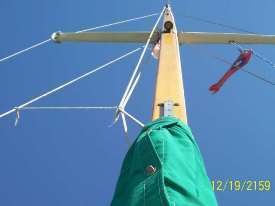 Only discrepancy I saw was concerning the boom roller furling but perhaps the boom was given to subsequent owner and reverted back to roller boom furling.